Will there ever be an updated course? 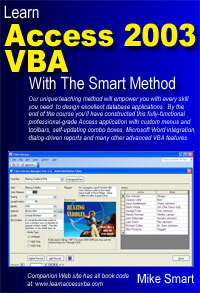 I get lots of e-mails asking if I will produce a 2016 version (or 2019 as it will arrive in the third quarter of 2018) of my Access 2003 VBA book. My days are very full at the moment keeping my Excel tutorials up to date. My free Basic Skills Excel tutorial is used by millions of students to learn Excel so I see it as a big responsibility in keeping it up to date. Perhaps one day I will reach the end of my “to-do” list and update the Access VBA book but it seems unlikely at the moment.